When I first began pitching in 2007, I wondered if there wasn’t some way to put a string at some height, located at someplace, to help with the proper launch height? Apparently, this is a common question for beginning pitchers. A search on the web came up with 60% downrange as the proper location for the crossing string. Parts 9 and 11 of this blog discuss the search and my findings. A recent posting of my findings on the NHPA forum raised a question about the validity of the formula used and the results. I indicated at that time I would follow up with further testing when the weather turned here in Maryland. Today, I was able to duplicate the findings and record them at 420 frames per second. The image above shows the positioning of three vertical posts. Post 1 is 7.5 feet from the release point, 9 feet from the foul line. Post 2 is at the highpoint calculated as 11 feet from the release point. Post 3 is 14.5 feet from the release point. Each post has a wrapping of tape 6.5 feet above the ground. The center of gravity of the shoe will pass by Post 1 going up to 6.5 feet (bottom of the tape), Post 2 at 6.8 feet (Highpoint) and Post 3 going back down to 6.36 feet. The two most important aspects of correct distance is the location of the Point of Release and the Initial Velocity of the Release (the speed of your arm swing). The location of the Point of Release and the Velocity determines if the shoe reaches the stake. The point of release determines everything except velocity. 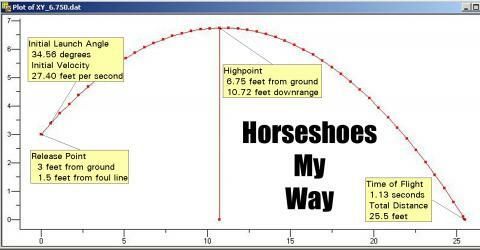 Where you release the shoe determines the launch angle and the launch angle determines the location of the highpoint. 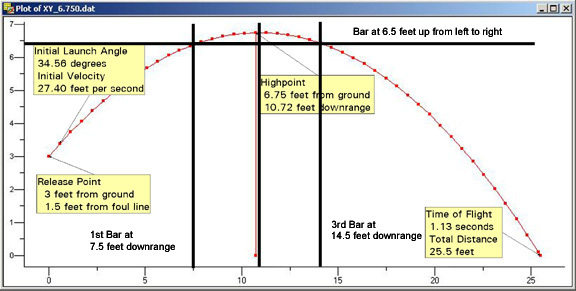 If you hit your highpoint downrange correctly your release point and velocity were correct. In effect if you don’t hit your highpoint, either the velocity and/or release point were incorrect. The two images below describe what happens if your HUB (shoulder) releases the shoe from various points in the forward swing along the swing arc. NOTE: The HUB has not moved for any throw. 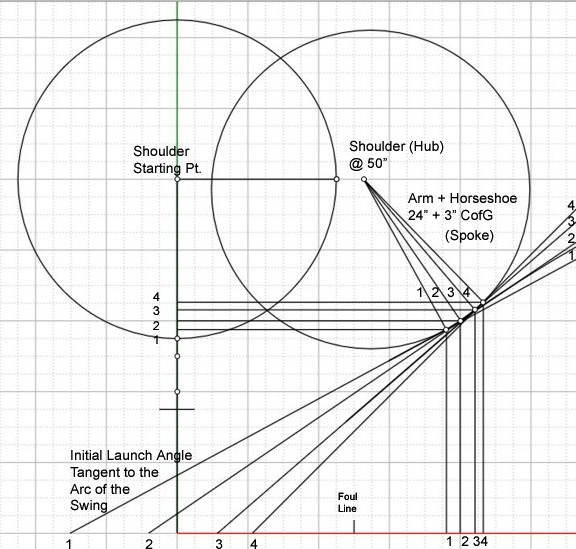 First, note that the launch angle is directly effected by the release point on the arc. 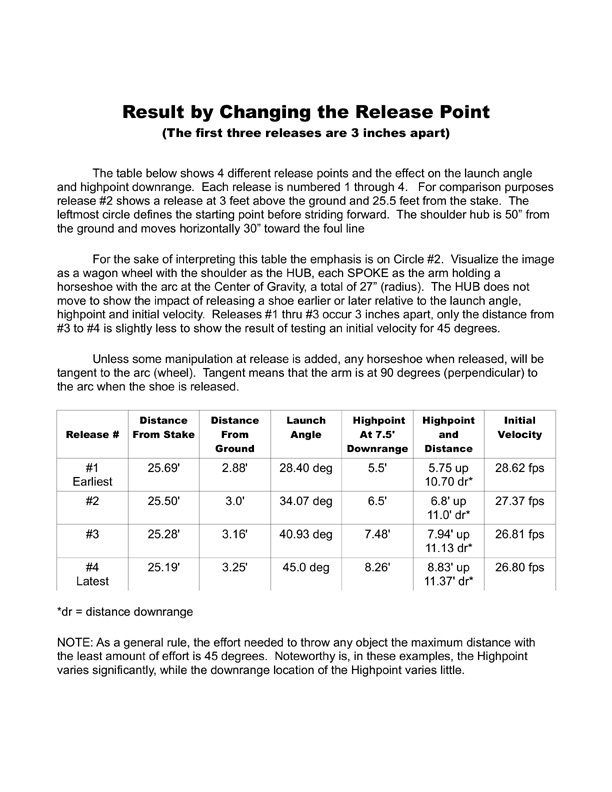 The earlier the release the lower the launch angle and the later the release the higher the launch angle. If you release the shoe at the correct location, but your arm swing is too fast or slow, the shoe will arrive above or below the highpoint. Below is a description of the image above. If the size is too small there is a link at the bottom for a larger PDF file. The Drop Angle is a continuation of the topic affecting the flight of a horseshoe. Part 30 describes the importance of the “Drop Angle” for salvaging all important points.